World Youth Alliance | Is breathing a choice? On a recent return flight to Brussels, I watched a movie that contextualized one of the most difficult questions raised in the debate on euthanasia and assisted suicide: if a physician gives the patient a terminal diagnosis, what difference does it make if the patient wishes to end their life sooner? 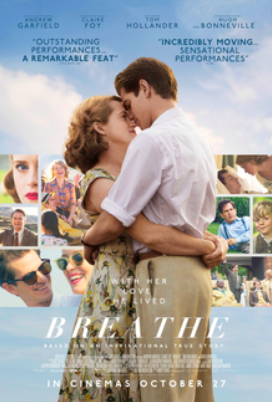 Released in 2017, Breathe recounts the true story of Robin Cavendish, a British man who becomes diagnosed with polio at the age of 28. It’s 1958 and such a diagnosis sends Robin to live the rest of his life on a respirator in an institution with others paralyzed by the poliovirus. Robin’s beautiful wife Diana is nearing the delivery date of their first child upon his admittance, and he quickly falls into an impenetrable depression. Defying the orders of Robin’s physician, Diana breaks him out of the hospital and they creatively build a life together with the help of an ingenious inventor, who equips Robin’s wheelchair with a respirator. Subsequently, Robin becomes a disability rights activist with the mission of transforming the standard of medical care for polio victims by integrating them into society with his wheelchair model. Robin went on living until age 64. Facing irremediable complications from lifelong use on the respirator, Robin requests assisted suicide from his physician. This decision marks the second time in which Robin contemplated suicide and shows different layers of ethical considerations involved: the perspective of taking one’s own life and the circumstances which informed Robin’s decision. When he was first admitted to the hospital, Robin’s life stretched-out before him confined to a bed. Life was stable but the quality of life was unacceptable until Dianna showed him a way out. Now at age 64, his days are terminally numbered and marked by daily complications from the respirator. This cost-benefit calculation, Spaemann argues, destroys life’s meaning because when we understand our lives as a whole, the inevitability of death reveals the futility of cost-benefit calculations. The two different points at which Robin evaluates his life according to cost-benefit calculations both evidence this futility–just as Robin couldn’t foresee the adventures that awaited him upon leaving the hospital, no more can he foresee the progressive nature of his disease with certainty. Moreover, Breathe shows how different circumstances imbue life with meaning. In his first cost-benefit calculation, Robin’s initial depression after his diagnosis shows how legalizing euthanasia and assisted suicide endangers the patient without adequate mental health support. Diana’s love brought Robin out of his depression so that he lived a full and satisfying life. In his second cost-benefit calculation, the medical complications that motivate Robin to end his life prematurely are rarely encountered in our medical system today because contemporary methods of pain management are very successful. Robin’s circumstances shows the ethical nuances which arise in end-of-life decisions while revealing the slippery slope of cost-benefit calculations.